I love to prepare branzino al cartoccio. The delicate meat of this fish retains all the moisture, and all the flavors blend nicely in the juices released by the fish. Also, all the aromas stay inside the cartoccio while the fish is cooking, which is a good thing if you cook in a small kitchen! 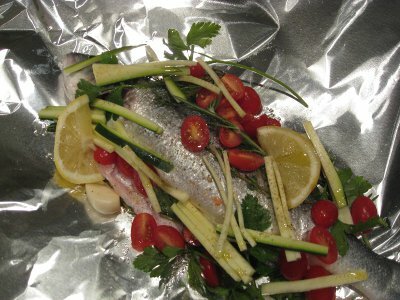 Place the fish with all the vegetables, herbs, and seasoning on the aluminum foil (or parchment paper). 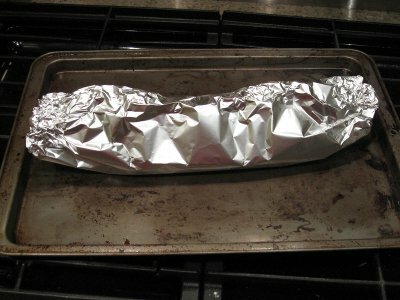 Wrap all the ingredients in the the foil, and close so that it is well sealed to trap in steam during baking. Place upon a baking sheet. Place in the oven, preheated at 375 F, to bake for about 20 minutes. Remove the cartoccio from the oven and open carefully letting out the hot steam. Each oven is different so the cooking time may vary a bit, also the baking time depends on the size of the fish. After 20 minutes baking, open the cartoccio and check if the fish is ready, if it needs more baking close the cartoccio and put back in the oven. To check if the fish is ready: (1) the eye should be a white ball, (2) pulling the side fin, it should come out easily, (3) making a small incision along the spine of the fish, the meat should come away from the bone relatively easy. 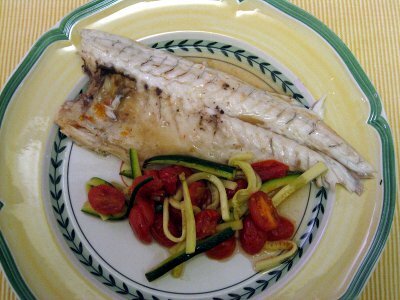 When the branzino is ready serve it right away: clean it (debone it and discard all the bones, the head, and the tail), discard the herbs and the garlic, and serve with the tomatoes, the zucchini and the cooking juices. A nice mixed salad, is a good complement to this dish. Mmmm…..I can smell the aroma from here!